Almost from their inception, holographic weapon sights found their way mounted on handguns for sport and competition use. The C-More Serendipity and Bushnell’s Holosight proved lightweight enough, yet strong enough to stand up to the rigors of hand gun hunting and competition. IPSC shooters such as Bruce Piatt, Jerry Barnhart and Doug Koenig won national shooting competitions using holographic weapon sights. The effectiveness of holographic sights in competition paved the way for their use on defensive handguns. While the holographic weapon sight made its way to rifles and carbines for military and police use, the journey to use on combat handguns would take a little longer. The “hard use” type sights developed by EOTech proved to be too large and heavy to be used on most handguns designed for self-defense. The first major inroad was by Doctor Optics, a German manufacturer who reduced the size of a holographic weapon sight so that it would fit in the dove tail mount of a pistol’s rear sight. The scope manufacturer Tasco followed with the Tasco Optima sight, yet this required machining of the pistol’s slide to accommodate the base of the sight. Smaller holographic weapon sights such as these fared well in competition, but it would be a modern combatives instructor named Kelly McCann who would bring them into the realm of the combat handgun by mounting a holographic weapon sight on his Glock Model 19. McCann’s reasoning had a little to do with aging eyes, as well as a desire to equip his handgun with a sight similar to the EOTech mounted on his carbine. The use of a holographic weapon sight on a defensive handgun promoted the technique of shooting with both eyes open. This is a crucial skill for contending with multiple targets and keeping the shooter from developing a condition known as tunnel vision. One of the more robust holographic weapon sights to make its way to the pistol demographic would be Trijicon with their “Ruggedized Mini Reflex” sight known as the RMR. The design was more robust by eliminating the use of lithium batteries and relying on the company’s pioneering use of tritium to power the dot. Handgun manufacturers such as Fabrique Nationale Herstal (FNH) took note of this trend and began offering certain tactical pistol models with a provision for mounting holographic weapon sights in the rear sight dove tail cut of the pistol’s slide. 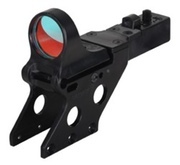 One of the drawbacks to these smaller handgun sights is that the prism is much smaller than on sights designed for larger guns, resulting in a smaller projected dot. Once the shooter is in the habit of properly aiming and acquiring the red dot, this drawback becomes a minimal concern and can be completely avoided. As technology improves, use of a holographic weapon sight mounted on a defensive handgun will become more widespread than it is currently. The sights have proven to be accurate, robust and do not prevent the handgun from fitting into a correctly designed holster appropriate for the firearm.